For the British Labour Party politician, see Charles Dukes, 1st Baron Dukeston. Charles Moss "Charlie" Duke Jr. (born October 3, 1935) is an American former astronaut, retired U.S. Air Force officer and test pilot. As Lunar Module Pilot for Apollo 16 in 1972, he became the tenth and youngest person to walk on the Moon. Duke has logged 4,147 hours flying time, which includes 3,632 hours in jet aircraft; and 265 hours in space, plus 20 hours and 15 minutes of extravehicular activity. A resident of New Braunfels, Texas, he is currently chairman of the board of directors of the Astronaut Scholarship Foundation. Duke was born in Charlotte, North Carolina, on October 3, 1935. He attended Lancaster High School in Lancaster, South Carolina, and graduated as valedictorian from Admiral Farragut Academy in St. Petersburg, Florida, in 1953. He was active in the Boy Scouts of America and earned its highest rank, Eagle Scout. Duke received a Bachelor of Science degree in Naval Sciences from the United States Naval Academy in 1957, and a Master of Science degree in Aeronautics and Astronautics from the Massachusetts Institute of Technology in 1964. Duke was commissioned upon graduation from the U.S. Naval Academy in 1957. Entering the U.S. Air Force, he went to Spence Air Base in Georgia for primary flight training, then to Webb Air Force Base in Texas for basic flying training, where he graduated with distinction in 1958 as a member of Pilot Training Class 59-B. Duke completed advanced training on the F-86 Sabre aircraft at Moody Air Force Base in Georgia, where he was a distinguished graduate. After completion of this training, Duke served three years as a fighter interceptor pilot with the 526th Fighter-Interceptor Squadron at Ramstein Air Base in West Germany. After graduating from the Aerospace Research Pilot School in September 1965, Duke stayed on as an instructor teaching control systems and flying in the F-101 Voodoo, F-104 Starfighter, and T-33 Shooting Star aircraft. Following his NASA retirement, Duke entered the Air Force Reserve and served as Mobilization Augmentee to the Commander, Air Force Basic Military Training Center and to the Commander, USAF Recruiting Service. He graduated from the Industrial College of the Armed Forces in 1978. He was promoted to Brigadier General in 1979, and retired in June 1986. In April 1966, Duke was one of 19 men selected for NASA's fifth group of astronauts. In 1969, he was a member of the astronaut support crew for Apollo 10. He then served as CAPCOM for Apollo 11, the first landing on the Moon, where his distinctive Southern drawl became familiar to audiences around the world. As CAPCOM, he became the voice of a Mission Control nervous by a long landing that almost expended all of the Lunar Module Eagle's fuel. Duke's first words to the Apollo 11 crew on the surface of the Moon were flustered, "Roger, Twank...Tranquility, we copy you on the ground. You got a bunch of guys about to turn blue. We're breathing again. Thanks a lot!" Duke was backup Lunar Module Pilot on Apollo 13; however, shortly before the mission, he caught German measles from a friend's child and inadvertently exposed the prime crew to the disease. As Ken Mattingly had no natural immunity to the disease, Mattingly was then replaced as Command Module Pilot by Jack Swigert. Mattingly would be reassigned as Command Module Pilot of Duke's flight, Apollo 16. 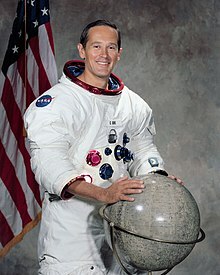 Duke served as Lunar Module Pilot of Apollo 16 in 1972 where he and John Young landed at the Descartes Highlands and conducted three EVAs, making Duke the tenth person to walk upon the surface of the Moon. He also served as backup Lunar Module Pilot for Apollo 17. Duke retired from NASA in December 1975. I'm proud to be an American, I'll tell you. What a program and what a place and what an experience. Duke, saluting the U.S. flag on the surface of the Moon, April 21, 1972. Apollo 16 (April 16–27, 1972) was launched from John F. Kennedy Space Center and was the fifth manned lunar landing mission. The crew consisted of John Young as Commander, Ken Mattingly as Command Module Pilot, and Duke as Lunar Module Pilot. Apollo 16 was the first scientific expedition to inspect, survey, and sample materials and surface features in the Descartes region of the rugged lunar highlands. Young commenced the then-record setting lunar surface stay of 71 hours and 14 minutes by maneuvering the lunar module Orion to a landing on the rough Cayley Plains. In three subsequent excursions onto the lunar surface, he logged 20 hours and 15 minutes in extravehicular activities involving the emplacement and activation of scientific equipment and experiments, the collection of nearly 213 lb (96 kg) of rock and soil samples, and the evaluation and use of Rover-2 over the roughest surface yet encountered on the moon. Other Apollo 16 achievements included the largest payload placed in lunar orbit (76,109 lb or 34,595 kg); first cosmic ray detector deployed on the lunar surface; first lunar observatory with the far UV camera; and longest in-flight EVA from a command module during transearth coast (1 hour and 13 minutes). The Apollo 16 mission was concluded with a Pacific Ocean splashdown and subsequent recovery by USS Ticonderoga. Duke has been married to Dorothy Meade Claiborne of Atlanta, Georgia since June 1, 1963. They have two grown sons; Charles M. Duke III (born March 8, 1965) and Thomas C. Duke (born May 1, 1967), and nine grandchildren. He and his wife reside in New Braunfels, Texas. Recreational interests include hunting, fishing, reading, and playing golf. Duke is an Eagle Scout and recipient of the Distinguished Eagle Scout Award from the Boy Scouts of America. Since 1978, Duke has been a committed born-again Christian. He wrote in his book that his temper, ego, single-minded devotion to work, and greed had ruined his relationship with his wife and his children, and his marriage teetered on the verge of divorce in the late 1960s and early 1970s. Duke and his wife, who became a Christian before him, both credit religion with making their lives much happier. Duke also stated that his marriage and relationship with his children became considerably better soon after finding religion. He is active in prison ministry. International Olympic Committee (IOC) President Thomas Bach presented the Sky is the Limit Trophy to Charles Duke in 2018. Duke was inducted into the South Carolina Hall of Fame in 1973 and the International Space Hall of Fame in 1983. He was one of 24 Apollo astronauts who were inducted into the U.S. Astronaut Hall of Fame in 1997. He was also inducted into the Texas Science Hall of Fame in 2000. In the 1998 HBO miniseries From the Earth to the Moon, Duke was portrayed by J. Downing. In the 2005 documentary Magnificent Desolation: Walking on the Moon 3D Duke was voiced by Scott Glenn, who had portrayed Alan Shepard in The Right Stuff. Duke is one of the astronauts featured in the 2007 book and documentary In the Shadow of the Moon. At the end of the documentary, in response to Moon landing hoax theories, he says "We've been to the Moon nine times. Why would we fake it nine times, if we faked it?" In 2018, Duke joined the Back to Space organization as an Astronaut Consultant with the goal of inspiring through film the next generation to go to Mars. ^ "Professional Profile". Charlieduke.net. Archived from the original on 2012-08-21. Retrieved 2015-05-13. ^ "Footagevault, Project MOCR". Footagevault.com. Archived from the original on 2013-06-15. Retrieved 2015-05-13. ^ "Astronaut Bio: Charles Duke 05/94". NASA Johnson Space Center. Retrieved July 17, 2013. ^ "International Space Hall of Fame :: New Mexico Museum of Space History :: Inductee Profile". Nmspacemuseum.org. Retrieved 2015-05-13. ^ Townley, Alvin. Legacy of Honor: The Values and Influence of America's Eagle Scouts. New York: St. Martin's Press. p. 79. ISBN 0-312-36653-1. Retrieved 2006-12-29. ^ "Distinguished Eagle Scouts" (PDF). Scouting.org. Retrieved 2010-11-04. ^ Jr, Mark Jones (2011-10-24). Charlie Duke Moonwalker. Rose Petal Press. ISBN 9780982657225. ^ Communications, Emmis (February 1988). Texas Monthly. Emmis Communications. ^ "Video: Charlie Duke - Interviews with the men on the moon". The Daily Telegraph. July 17, 2009. Retrieved July 26, 2018. ^ "Astronaut Charles Duke who brought the Olympic spirit to the Moon honoured by the IOC - Olympic News". International Olympic Committee. 2018-12-13. Retrieved 2018-12-15. ^ "Charlie Duke | Astronaut Scholarship Foundation". Astronautscholarship.org. Retrieved 2015-05-13. Wikimedia Commons has media related to Charlie Duke.